This is one of the top priorities of the Amsterdam municipality, since the Participation Act and the new Social Support Act came into force on January 1st, 2015. A complex issue that asks for a multi-stakeholder approach, says the municipality and they ask Perspectivity to help out. Perspectivity designs and facilitates a Participation Lab. 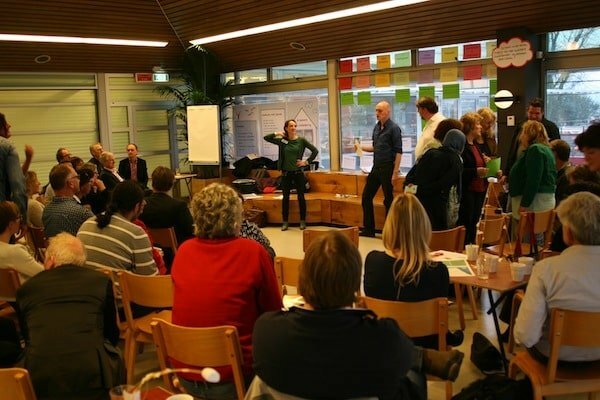 For six days, 65 stakeholders work together on solving the obstacles around day care and participation for people with a distance to the labour market, by improving existing processes and designing new experiments. The lab takes place at the end of 2015 in the Tolhuistuin in Amsterdam. Finally we swap knowledge about the content and direction of our work together. I trust that we will make some real improvements. It is a diverse crowd with widely varying perspectives on the issue: those concerned directly, interest groups, day care providers, referrers, funders, employers, volunteers and informal caregivers, researchers and experts, reintegration and activation professionals, wellbeing and community organisations and the municipal focus team Meedoen Werkt (participation works). The group is a reflection of the system around the central question. Together they map out the whole elephant to gain a shared view of the issue. In small groups, future scenarios are sketched as input for shared ambitions. The lab eventually leads to 14 project plans for experiments that allow more vulnerable Amsterdammers to sustainably participate. The end of the participation lab is the start of a new phase: the development and execution of the experiments. At the start of 2016, the teams will start working on the experiments and will contact the other organisations involved.